This Petite typewriter is in great condition and works. I wanted to show the stamped lettering along bottom. The Royal works just great while the L.C. Smith is a mantle piece. This is one of my favorite machines. 1936 Corona Silent. Serial #1S 46918. 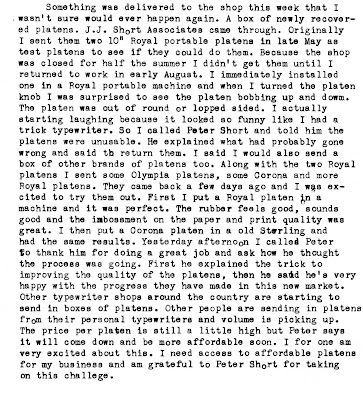 So glad to hear about Peter Short and the growing market for platens. It's also encouraging to hear that he foresees platen prices tapering off to an affordable level. Whoa, an unused Ivrea-made Lettera 32 that's still in its original packaging??? I would have gone bonkers! 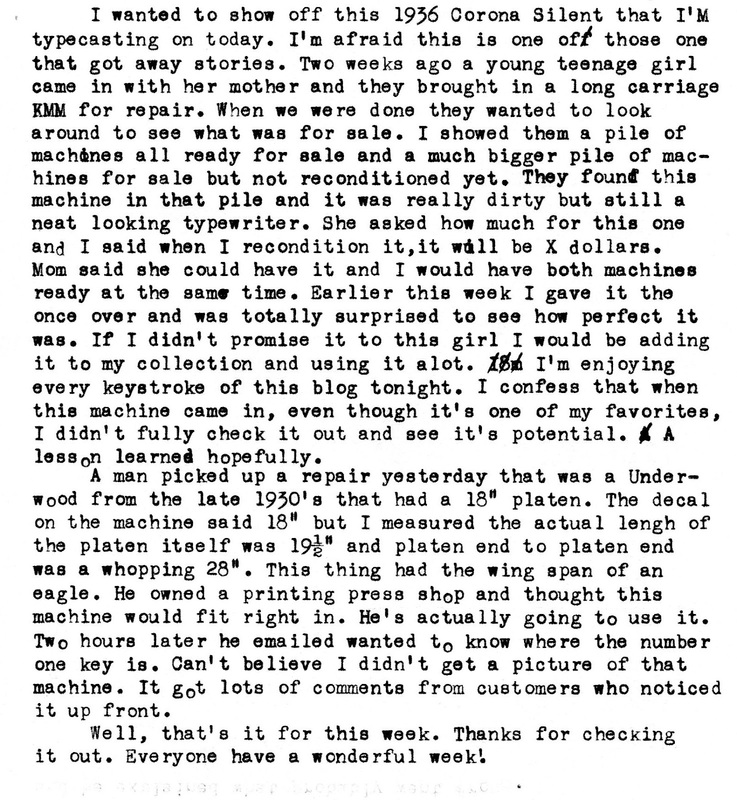 Back in late 2001, I bought a Valentine in its original packing material, never used, that was part of a group of machines found at a warehouse for a business. Since I had two other Valentines (used) I decided to sell the unopened one on eBay a few years later. 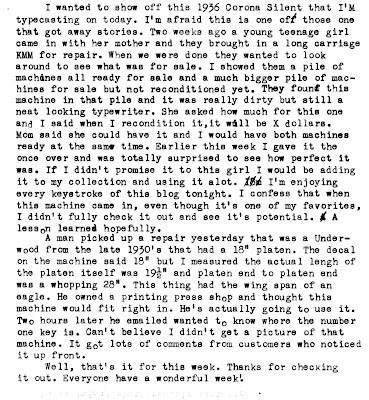 This was before I began collecting typewriters in earnest -- and I wish I still had that one! I definitely plan on sending a few platens over to JJ Short soon. I never did send one to Ames, so this will be my first time using a recovered platen. Quite exciting, and I have been hearing great things about their product lately. 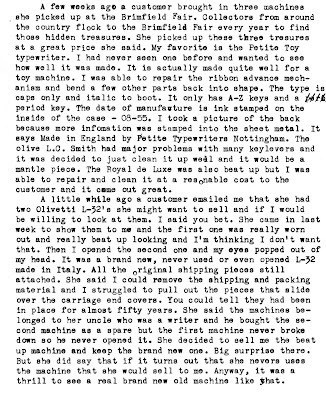 An unopened Lettera 32 must be awesome to see. Really, any unopened/unused machine. Why would she bring it in if she wasn't going to sell it? The Corona Silent is a beauty. One just like it was one of my best thrift store finds ever (although some damage was done by an idiot who didn't understand how to open the case and pried it open). I fixed up the machine and now it belongs to a colleague. That Corona Silent is fantastic! Too bad you did not get the new Lettera 32. That is one super rare find!. 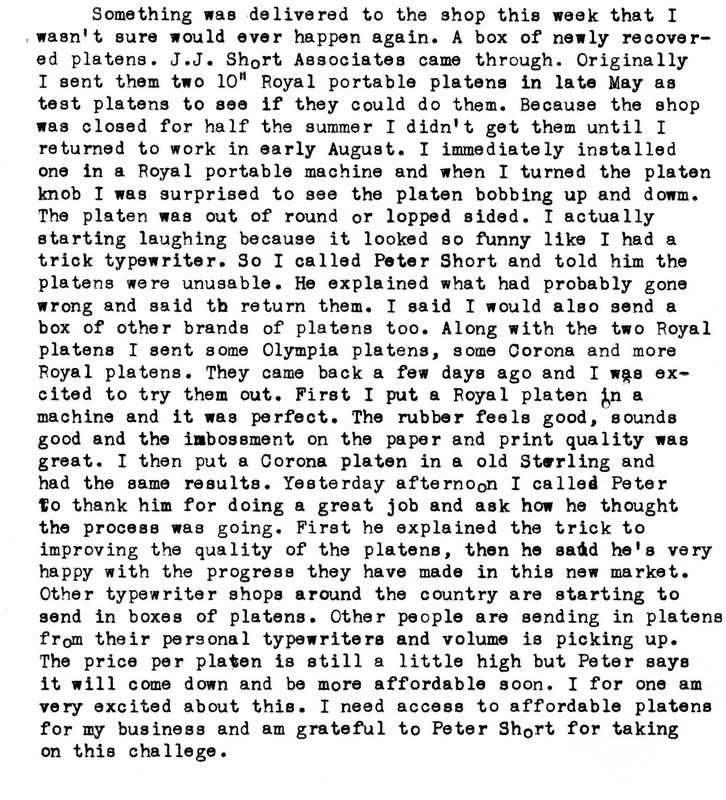 Good to know platens are working out at JJ Short Co. I was going to get my Hermes done since I have several, but got hit with unexpected bill and will need to wait until after Christmas which is good since I now decided on some older machines if they can do them. Oh, I also meant to express my gratitude and relief at the good news about the Short platens. 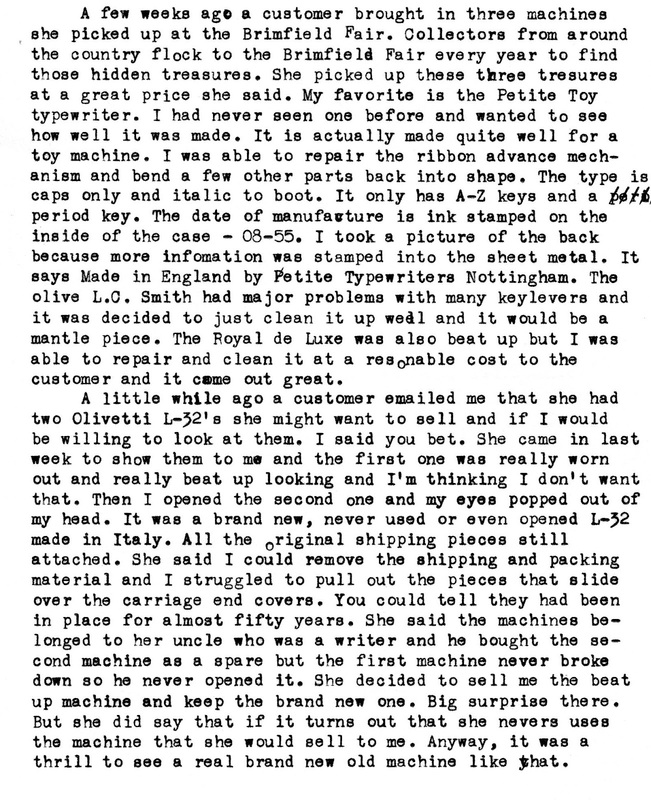 Ton- I was thinking of people who would appreciate a brand new old Olivetti and thought of you. Cameron- There are so many machines I wish I could have back. That brand new Valentine must have been a big thrill. Ken- I think in a few more months you will see the cost of platens come down a little more. Richard- Glad you liked the Petite. Thanks for including me in your revision. In looking up info on the Petite I came across your post on the Byron. Also got Robert Messengers post on Byron. You guys are great. Thanks. Bill- Thanks for your great comments. Knowing someone is going to make quality affordable platens and rollers is a huge relief. Figured you'd want to know. Richard- Thanks a million, I'm there!